Don’t believe the Super Duke R puts out mountains of torque? This used to be a straight road. I enter this test coming from a unique perspective. 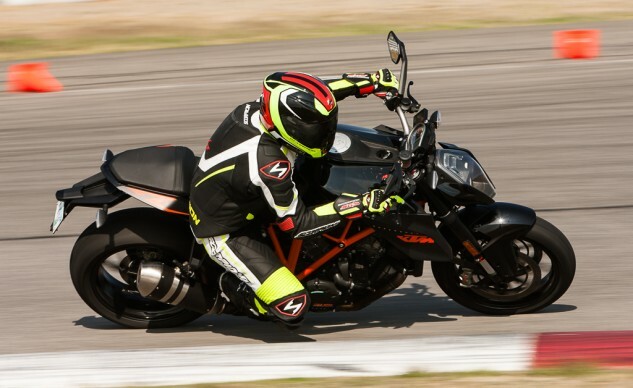 Since I missed the first go-round of naked streetfighter testing, I came back to my fellow colleagues badgering on about their lust for the KTM 1290 Super Duke R. Words like “Oh my god,” “incredible,” and “amazing” were heard more times than I can remember. I wasn’t sure if everyone was testing motorcycles or had simultaneously lost their virginity. Weirdos. Either way, I wanted to reserve judgement until I could throw my own leg over the mighty KTM. When I did, I understood what all the fuss was about. Actually, that’s not entirely true. Auto Club Speedway, where we tested this time, is the polar opposite to Chuckwalla Valley Raceway (where Part 1 took place) in terms of track layout. Where CVR is tight with relatively little shifting, ACS is long with a few tight chicanes thrown in. The left toe sees a lot more action, and it’s one of the few places a literbike can actually wind out sixth gear. This exposes both the strength and weakness of the KTM. When a motorcycle truly makes you happy, there’s no greater expression of this joy than lofting a big wheelie. Unfortunately, with all the shifting involved, the lack of a quickshifter – something the other two came equipped with – was a big detriment to going fast. This issue really came to light powering through Auto Club’s Turn 4, a long left sweeper requiring a short shift while leaned over. Balancing the throttle blip while being careful not to drag your toe on the ground while simultaneously flicking an upshift required more concentration compared to the BMW and Aprilia. Sure, a perfect shift was possible, but there was a greater margin for error. Transitioning from left to right quickly is not where the KTM shines. However, the Super Duke R makes up for this with the ability to place it wherever you want it with pinpoint accuracy. While I concur with both Tom’s and Kevin’s assessment, I personally appreciated the accuracy of the KTM’s chassis, though I’m stopping short of calling it the best in the bunch. The suspension, too, responds well to changes. After some significant tweaks to the damping between sessions, Duke came back much happier. 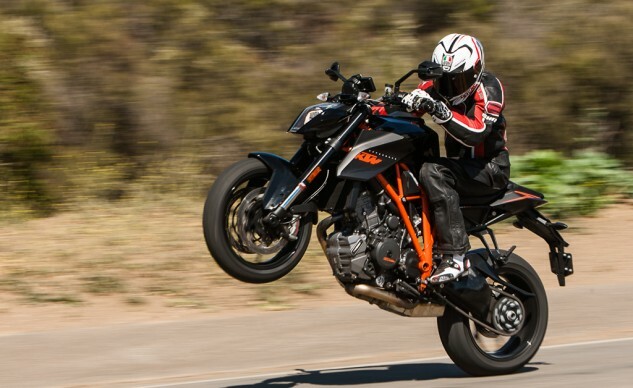 “The Super Duke R is so much better after the suspension adjustments, with much improved control of both ends,” he said. Despite this, Duke reported some scuffing of the pegs, something Tom and I didn’t experience. 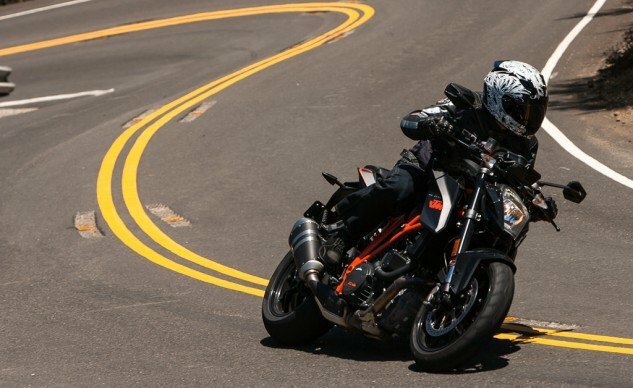 On the street, we still love the KTM’s sweet engine, and the lower speeds means the lack of a quickshifter is less of an issue. Torque is king on the street, and the SDR’s 96.5 ft-lbs made it the ruler of this domain. In the twisty bits, we could be lazy in our shifts, comfortable in the knowledge the gobs of torque would pull us out of any situation. 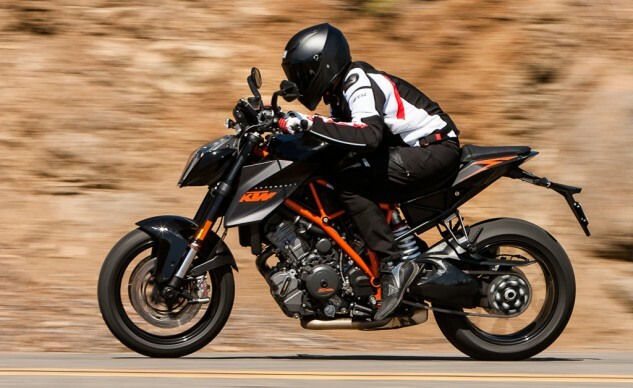 For a motorcycle that looks as aggressive as the Super Duke R, its comfortable ergos are a pleasant surprise. There’s plenty of room to scoot fore and aft on the saddle, and the footpeg placement offers generous legroom. My praise for the precise chassis solidified itself during our street ride, since I felt as though I could place the Super Duke R anywhere I wanted. Combine this with the ultra-communicative M50 Brembos, and the KTM gave me a level of control the Aprilia and BMW simply couldn’t match. But notice I never called the KTM agile. 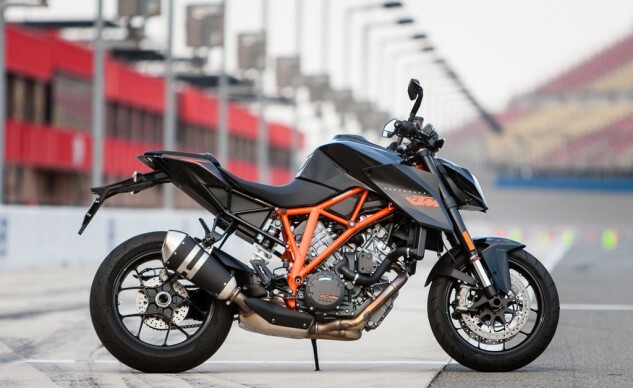 Duke agreed, noting, “The Super Duke might be the best solution for big/tall riders who decry that sportbikes don’t fit them.” The rider triangle is roomy, and the seat has a surprising amount of cushioning. It would make us incredibly happy to be greeted by one of these each time we walk into our garages.